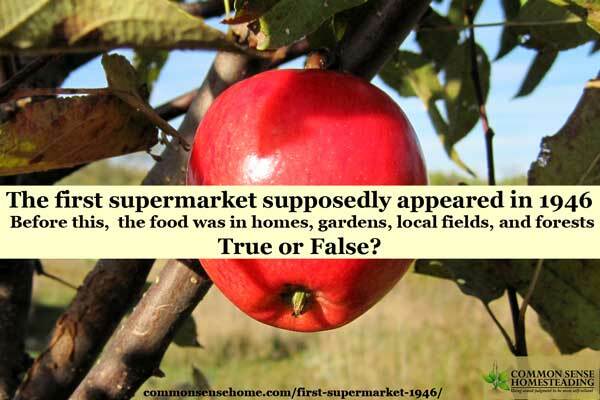 The First Supermarket Appeared in 1946 - True or False? 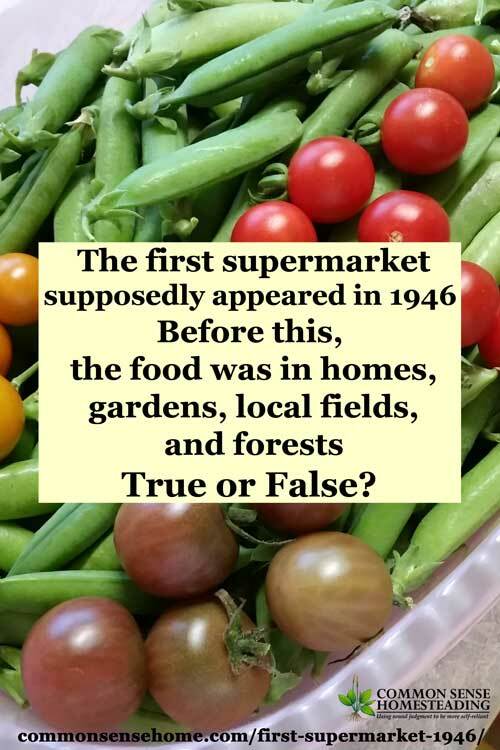 You are here: Home / Gardening / The First Supermarket Appeared in 1946 – True or False? The First Supermarket Appeared in 1946 – True or False? If you're on social media at all, you've probably seen this attached to a smiling picture of Joel, or a backyard garden, or a chicken coop or a bucolic country scene. It's been shared thousands of times. The thing is, as much as I love Joel's work, this is an inaccurate and overly romanticized perspective of our food system. Chain grocery retailing was a phenomenon that took off around the beginning of the twentieth century, with the Great Atlantic and Pacific Tea Company (established 1859) and other small, regional players. Grocery stores of this era tended to be small (generally less than a thousand square feet) and also focused on only one aspect of food retailing. Grocers (and most of the chains fell into this camp) sold what is known as “dry grocery” items, or canned goods and other non-perishable staples. Butchers and greengrocers (produce vendors) were completely separate entities, although they tended to cluster together for convenience’s sake. Clarence Saunders’ Piggly Wiggly stores, established in Memphis in 1916, are widely credited with introducing America to self-service shopping, although other stores (notably Alpha Beta in Southern California) around the country were experimenting with the idea at about the same time. Self-service stores came to be known as “groceterias” due to the fact that they were reminiscent of the cafeteria-style eateries that were gaining popularity at the time. It was not until the 1920s that chain stores started to become a really dominant force in American food (and other) retailing. Small regional chains such as Kroger, American Stores, National Tea, and others began covering more and more territory, and A&P began moving toward a more national profile, operating over 10,000 of its “economy stores” by the end of the decade. Most of these stores remained small, counter service stores, often staffed by only two or three employees, with no meat nor produce departments. Some still offered delivery and charge accounts, although most chain stores had abandoned these practices. Even without David's detailed research, any historical reading where food is mentioned – or even watching some TV shows and movies – will show that people depended heavily on dry good stores well before the advent of the modern supermarket. From the Little House on the Prairie series, where the talked about endless meals of nothing but salt pork and corn bread, to The Jungle by Upton Sinclair, which brought national attention to food safety and health issues in the American factory, it's clear that folks in both the country and the city depended on purchased foods. Canned (commercially tinned) food was invented in the early 1800's, and eventually became a staple in many households (and still is today). Even those who lived largely off the land, like my grandparents back during the Great Depression and WWII, still purchased some dry goods, like flour and salt, from the grocery store. Our food system has extended well beyond local food production for over 100 years. Implying that a magical switch was flipped in 1946 that ended local food production is oversimplifying a trend that has been building for decades. I don't know about you, but there are some things I truly love about the modern food system. Refrigeration is awesome, and it's great to have access to fresh produce when the root cellar and canned goods are getting low and nothing is ready in the garden. To have such abundance available would have amazed folks 100 years ago. Being able to get salt, pepper and other spices and basic dry goods is very handy, too. What I don't like about the modern supermarket is the aisles and aisles of “almost food” – things that are heavily processed to have the shelf life of an Egyptian mummy with flavors created by a team of chemists. There are over 4000 products in the average supermarket that contain corn in some fashion (most of it genetically modified). No one really needs that many ways to eat corn. It gives the illusion of choice, but in reality most of this “almost food” is generated by a small group of very large corporations. Hyperbole might get people inspired or outraged, but reality is needed to get things done. I think the convenience of the one stop grocery stop isn't likely to lose its attraction, but I hope we can continue to make progress in improving the quality of supermarket foods. I also encourage people to think outside the Big Box store, and support independent local growers and grow their own food. Making it as a small market grower is a heck of a lot of hard work, and your purchase is noted and appreciated. At the supermarket, for the most part, you're just another number. What do you think is the best way to build a healthier, safer food system with ample food for all? I'd love to hear your thoughts in the comments below. Last night I made a vegetable soup with dandelion greens,potatoes,onion,garlic,ginger etc and I am enjoying it. This is the second I made and it is so good for liver and my stomach bacterias etc. I happy that you are promoting this healthy vegetables to our the people who go to your webpage. This is a very interesting article. My husband and I are small business owners in the food industry. During the past nine years we have become very knowledgeable about how food has become so bad for us. And, not just the processed food and all the food with corn — as you’ve mentioned. Look at the mutant seed being planted and the growing methods to include all the herbicides and pesticides. We really don’t even know what we’re getting at the farmers’ markets, if you think about it. I also wrote a blog about how good butter is for us but no one knows it because of the marketing. Can you tell, your blog hit nerve with me? It is appalling what has been done to our food and what that food is doing to the health of our people. Further, during WWII, the government actually gave everyone two chickens and seeds, so that people could take care of themselves. But now, since there’s only three days’ worth of food in the grocery store, when disaster strikes, what will the people do? Well, I think I’ve ranted enough;) Thanks for the valuable information you share! Interesting that you should mention the farmers market, as Amber and I were just talking about the misrepresentation of products that has become commonplace. I have a post about health benefits of butter, too. If something disrupts the food supply, I think a lot of people are going to be in big trouble. Farmers markets are great if the food is local, because word gets around fast if you have misrepresented yourself. A lot of it is trust. And finally I am so happy butter has lost it’s bad rap. I just love butter, that is the good kind. Thank you for your article – I found it very informative. I don’t have the expertise to make a comment regarding how to “build a healthier, safer food system with ample food for all,” however, I was impressed with one meat processor that I had read about (and can no longer remember the name) but they humanely raised the livestock on open pasture and humanely euthanized them prior to processing. They processed smaller amounts of livestock and there was less disease and stress on the animals due to the way they were raised. Perhaps if this model were practiced in each state, it would help local economies, the quality of the food should be better, and if each state raised its own, they could also process a portion of it for long term storage in case of emergencies. Kind of like Joseph in the Bible. He interpreted the kings dream of 7 years of feast and 7 years of famine and by storing up food during the good years, they were able to feed the population during the years of famine. We are lucky enough to be able to get our meat from a local friend who follows that model. Very good quality beef. It all starts in the home.We need to educate ourselves on how to eat to live not live to eat. We need more families cooking and eating together in a more healthy way.The demand for food is high because we are over indulging ourselves with food which is contributing to obesity and health issues and forcing some farmers and companies to use harmful practices to keep up with the consumer demand.